Battle of the lagers: Can Kronenbourg 1664 rise to the top? In an attempt to make their latest campaign a success Kronenbourg 1664 hired French Football legend Eric Cantona to promote its brand in a French set TV commercial. The brewers did not, however, expect to see their advert banned by the Advertising Standard Authority (ASA) for misleading consumers about the true origins of the lager after it was revealed that the beer was in fact brewed in Manchester. Luckily for Kronenbourg, the ban was reversed in June after its parent company, Heineken, argued that Kronenbourg was “inherently a French beer” and the watchdog ruled that consumers would understand the beer’s association with France. 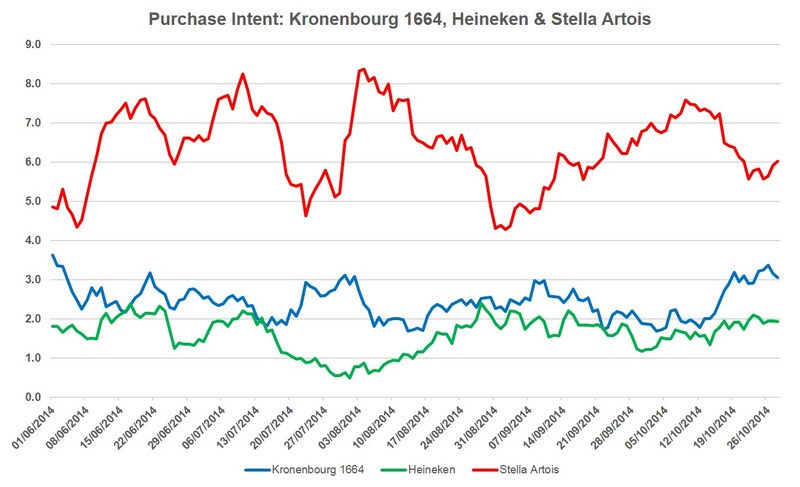 Using YouGov’s brand perception tool, BrandIndex, we can gauge how Kronenbourg fares against competitor Stella Artois and parent company Heineken since the ban was revoked. 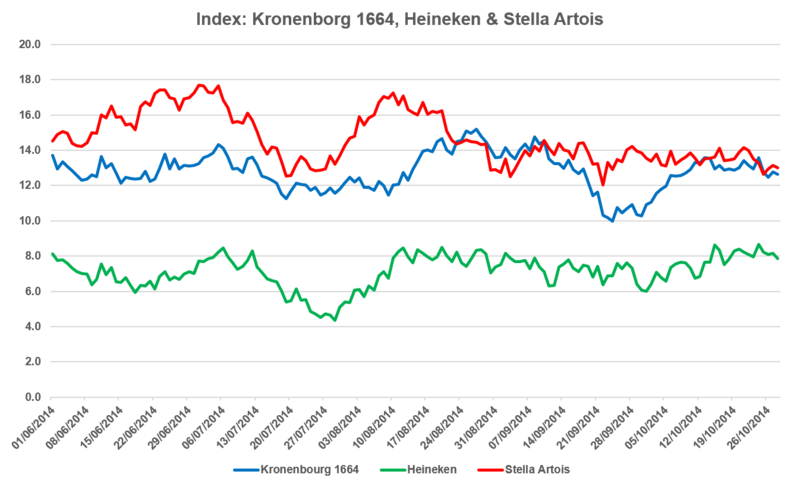 If we consider the Index scores, which measures overall brand health, we see that the average score for Kronenbourg is 12.8, which is 1.9 behind that of Stella Artois (14.7). Although Stella Artois’ average is slightly higher, we can see from the chart that both brands are currently head to head in this metric. Heineken on the other hand, is behind with an average score of 7.1. The BrandIndex Ad Awareness score assesses whether respondents have seen a brand’s advert over the previous two weeks. 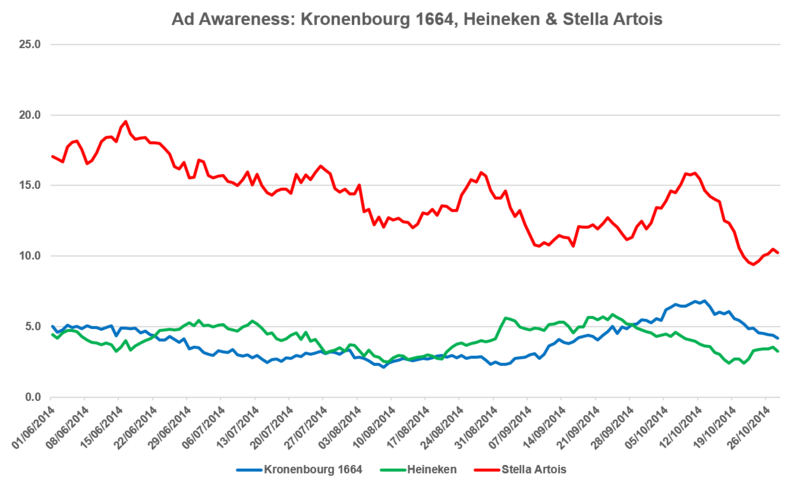 Although Stella Artois’ ad was released months prior to its two competitors, we can see that the brand is still higher in peoples mind when compared with Kronenbourg and Heineken. Since 1 June, the average score for Stella Artois is 14.3%, while Kronenbourg has an average of 3.9% and Heineken 4.2%. The purchase Intent metric, which measures whether respondents are most likely to purchase from a particular brand, mirrors that of its Ad Awareness score. Stella Artois’s leads with an average score of 6.4%, while Kronenbourg and Heineken follow with an average of 2.4% and 1.6% respectively. Although Kronenbourg may be slightly behind Stella Artois in certain metrics, its overall brand health shows some promise. Based on these scores, it seems there is still hope for Kronenbourg to overtake Stella Artois.